WARNING: Do NOT attempt to hang a TV with a loved one unless you're prepared to test the boundaries of your relationship. Hanging a TV together could cause stress and an overwhelming desire to bash the TV over the other person's head. My TV is hung and the room is finally starting to come together! I have to tell you, getting the TV up was one of the most stressful moments of my life. Warranties and insurance policies only cover the TV if the pros come in to mount the TV and THEY drop it...they don't cover it if you install it yourself. Not wanting to pay the $300 it costs to have the GeekSquad do something I could do myself, I decided that Jerome and I would mount the TV. Jerome, of course, was completely terrified and no amount of reassurance could convince him that I wouldn't destroy our new favorite posession. 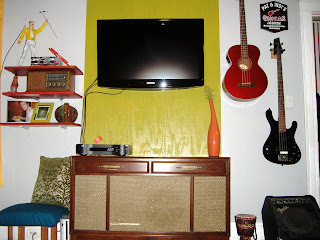 To freak him out even more, I wanted to mount a wall panel to the wall and then mount the TV on top of the wall panel. I think he wanted to kill me. 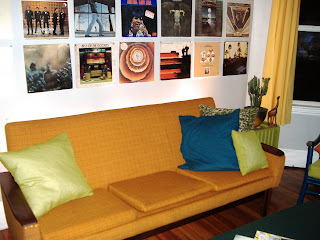 I wanted the wall panel to add color and texture to an otherwise boring grey wall. It would frame the TV and be a nice splash of excitment. Originally, I was going to use a premade 4' x 8' wall panel from Home Depot. They come in several different tile and faux woods. I was going to buy one of the wood panels and then paint over it so that I could have the nice wood grain but in a color that went with the room. The only problem with the premade panels was that they don't have the actual wood grain, just the faux wood finish...this means that if you paint over it, you'll never see the wood texture showing through. I could have kept the wood panel as is without painting, but none of the woods coordinated with the woods we already have in the room and I didn't want to introduce anything new. So, I picked a regular 1/4" 4' x 8' sheet of plywood. To his credit, this substitution was Jerome's idea and quite a good one! The real trouble came when we got home. First, I figured out where the wood panel was going to be on the wall. Then, I figured out where the TV would go and did all the proper measurments to make sure the mount was in the right spot. After marking up the wall with all kinds of calculations, I transfered all the measurments to the plywood. This was the hardest part. When mounting a TV, you want to hit the studs in the center so I couldn't afford any wrong calculations between the wall and the panel or else I could risk not hitting a stud (and having my TV fall!). This is the part where we almost killed each other. After hours of drilling and marking and arguing and tightening screws until we couldn't tighten anymore, we were finally done! Seeing our TV up made us happy and we completely forgot about all the stress and pain it took to get it there. It's so pretty. I hung the shelves on Sunday and now, the living room is almost complete! We have our gorgeous 1960's radio on the shelf, our beautiful 70's Hi-Fi player, and our elegant new flat screen hanging above it. And the good thing is, all three pieces work! Our music inspired living room is almost complete. Now all I have to do is finish the curtains and seat cushions and this room will be PERFECT!